This past weekend was cause to geek out. First, the boys and I went to Free Comic Book Day. 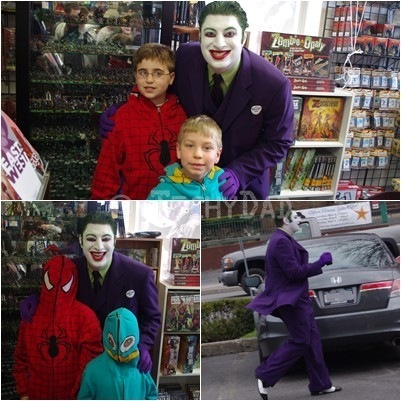 We all exited having obtained some cool comics and having met Black Widow and The Joker. Next came Star Wars Day. We first went to the library to look for some Star Wars cooking books. (Star Wars Cookbook: Wookie Cookies and Other Galactic Recipes and Star Wars Cookbook II: Darth Malt and Other Galactic Recipes.) We were also hunting for The Simpsons, Season 2. The boys are now hooked on the adventures of Homer, Marge, Bart, Lisa, Maggie, and company. We own season 1, but buying every season would be cost prohibitive. After all, The Simpsons are already in season 25! 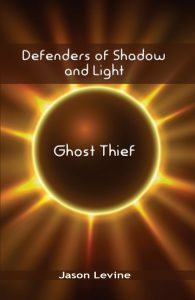 While the library didn’t have that, they were able to put in a request for it for me. While there, we found some other books and games to take out – including a Clone Wars Lightsaber Duel game for the Wii. That night, JSL wanted to eat dinner with his grandparents, so we took NHL out and then stopped by some stores to buy some gifts for Star Wars Day – including used copies of three Star Wars games for the Wii. The next day, after Hebrew School, we ate a quick lunch out, made a grocery store run, and then headed home. The boys got some of their Star Wars toys and had fun with them and the games. 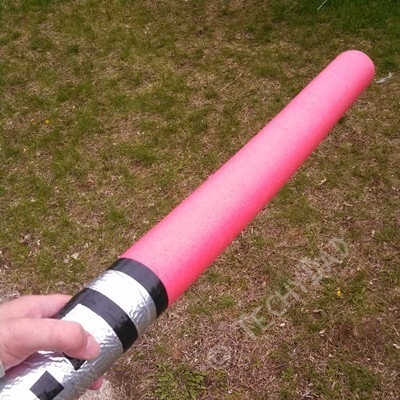 Thankfully, the weather held out and we were able to play outside with the boys’ foam lightsabers as well. 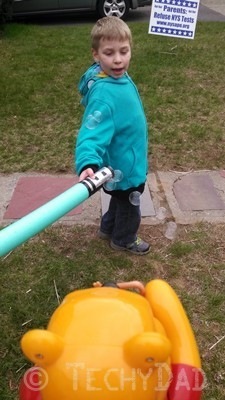 In addition to the usual battle to the death (followed by – in a bit of Doctor Who-Star Wars crossover – our characters regenerating and joining the battle again), I took out a bubble making machine and let JSL slash at the bubbles with his lightsaber. This turned out to be quite the brilliant activity to let him get all of his energy out without me getting exhausted. Of course, for dinner, we had Boba Fett-uccini and That’s No Meatballs. 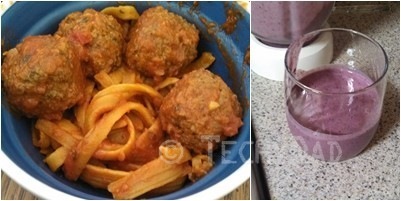 (Veggie meatballs.) We closed out Star Wars day with a Jedi Smoothie. I was originally going to call this "blue milk" but it came out more purple than blue. Perfect for Mace Windu’s lightsaber, though. All in all, this was quite the successful geek-filled weekend!